200 Clarendon Street, previously John Hancock Tower and colloquially known as The Hancock, is a 60-story, 790-foot (240 m) skyscraper in Boston. The tower was designed by Henry N. Cobb of the firm I. M. Pei & Partners and was completed in 1976. In 1977, the American Institute of Architects presented the firm with a National Honor Award for the building, and in 2011 conferred on it the Twenty-five Year Award. It has been the tallest building in Boston and New England since 1976. The street address is 200 Clarendon Street, but occupants use both "Hancock Place" and "200 Clarendon Street" as mailing addresses for offices in the building. John Hancock Insurance was the main tenant of the building when it opened, but the company announced in 2004 that some offices would relocate to a new building at 601 Congress Street, in Fort Point, Boston. The tower was originally named for the insurance company that occupied it. The insurance company, in turn, was named for John Hancock, whose large and conspicuous signature on the United States Declaration of Independence made his name so famous in the U.S. that a colloquialism for a signature is "a John Hancock." A major concern of the architects while designing the tower was its proximity to Boston's Trinity Church, a prominent National Historic Landmark. Their concern led them to redesign the tower's plans, as there was a public outcry when it was revealed that the Hancock Tower would cast its shadow on the church. During the excavation for the tower's foundation, temporary steel retaining walls were erected to create a space in which to build. The walls warped, giving way to the clay and mud fill of the Back Bay which they were supposed to hold back. The inward bend of the retaining walls damaged utility lines, the sidewalk pavement, and nearby buildings—including the historic Trinity Church across St. James Avenue. Trinity Church won an $11 million lawsuit to pay for repairs. There were problems with the innovative use of blue reflective glass in a steel tower: Entire 4′ × 11′, 500-lb (1.2 × 3.4 m, 227 kg) windowpanes detached from the building and crashed to the sidewalk hundreds of feet below. Police closed off surrounding streets whenever winds reached 45 mph (72 km/h). Under the direction of Frank H. Durgin of MIT's Wright Brothers Wind Tunnel a scale model of the entire Back Bay and an aeroelastic model of the John Hancock Tower were built and tested in the wind tunnel to identify the problem. The research raised questions about the structural integrity of the entire building (due to unanticipated twisting of the structure), but did not account for the loss of the glass panels. An independent laboratory eventually confirmed that the failure of the glass was due to oscillations and repeated thermal stresses caused by the expansion and contraction of the air between the inner and outer glass panels which formed each window; the resilient bonding between the inner glass, reflective material, and outer glass was so stiff that it was transmitting the force to the outer glass (instead of absorbing it), thus causing the glass to fail. During the many months it took to diagnose and repair the building, sheets of plywood replaced many of the missing glass windows of the building, earning it the nicknames "Plywood Palace" and "Plywood Ranch" (the same name as a local lumber yard chain at the time). Bostonians joked that the Hancock Tower was "the world's tallest plywood building". The John Hancock Tower seen from the Prudential Tower; on the left is Copley Square (and Trinity Church), to the upper left is the Boston Common, on the right is the Massachusetts Turnpike (I-90) and to the top right is Logan International Airport. An observation deck with views of Boston was a tourist attraction. However, it was closed after the September 11, 2001, terrorist attacks. Because of the closure of the John Hancock Tower's observation deck, the highest observation deck open to the public in Boston is in the Prudential Tower. The company that built the Hancock Tower and two earlier, similarly named buildings is known loosely as "John Hancock Insurance", or simply "John Hancock". It was known as "The John Hancock Life Insurance Company" in the 1930s and "The John Hancock Mutual Life Insurance Company" in the 1940s. As of 2000, the company owning the buildings was John Hancock Financial Services, Inc. with various subsidiaries such as The John Hancock Variable Life Insurance Company and Signator Investors, Inc. In 2003, Manulife Financial Corporation of Toronto acquired the company, but it still uses the name "John Hancock Financial Services, Inc." and those of various subsidiaries. The TV series Fringe shows the building as the location of FBI Headquarters. 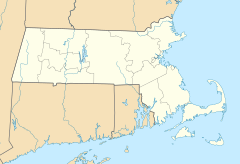 However, the actual FBI Boston headquarters are located at One Center Plaza, although the FBI has since relocated to nearby Chelsea, Massachusetts. In September 2015, the French photographer and artist JR created a 150-by-86-foot (46 by 26 m) tall mural of a man wearing shorts, between the 44th and 50th floors of the building. According to the property manager, the mural was the final piece in a three-part series of temporary public art projects at the building. ^ a b Logan, Tim. "So, what should we call the John Hancock Tower now?". The Boston Globe. Retrieved 2016-01-19. ^ Farragher, Thomas (24 September 2006). "Hancock Tower at 30: 60 stories and countless tales". The Boston Globe. boston.com. Retrieved 2013-07-22. ^ Wiseman, Carter (1 September 1990). I.M. Pei: A Profile in American Architecture. New York: Harry N. Abrams. pp. 139–153. ISBN 978-0810937093. ^ a b c Goodison, Donna (July 31, 2015). "Hancock signs off as name of tower". The Boston Herald. Retrieved January 19, 2016. ^ a b Levy, Matthys; Salvadori, Mario (1992). Why Buildings Fall Down. W.W. Norton and Company. pp. 203–205. Retrieved 2013-07-22. ^ "How Art Springs Forth From Broken Windows". The New York Times. NYTimes.com. 3 January 1988. Retrieved 2013-07-22. ^ a b c Campbell, Robert (3 March 1995). "Builder Faced Bigger Crisis Than Falling Windows". The Boston Globe. The Pulitzer Prizes. Archived from the original on July 29, 2013. Retrieved 2013-07-22. ^ Colletti, Carolyn (14 September 2001). "Hancock Tower observatory is shut permanently". The Boston Globe. boston.com. Retrieved 2013-07-22. ^ Park, Madison (15 June 2005). "Searching for an answer on 60th floor". The Boston Globe. boston.com. Retrieved 2013-07-22. ^ Gross, Daniel; Stuart Johnson (5 September 2009). "The Skyscraper That Ate a Billion Dollars: Boston's Hancock Tower and the coming commercial real estate crisis". Slate. ^ Yu, Hui-Yong; Green, Peter S. (31 March 2009). "Hancock Tower Sells at About Half Price to Normandy". Bloomberg BusinessWeek. Retrieved 2013-07-22. ^ Ross, Casey (31 March 2009). "Hancock Tower sells for $660m at auction". The Boston Globe. boston.com. Retrieved 2013-07-22. ^ "Boston Properties buys Boston tower for $930M". Bloomberg BusinessWeek. Associated Press. Archived from the original on 2010-10-07. Retrieved 2013-07-22. ^ Gallagher, Tina (14 September 2011). "'Fringe' Trivia: 10 Things You Didn't Know About Your Favorite Show". Yahoo!. Retrieved 2013-07-22. ^ Annear, Steve (2015-09-24). "Mystery solved: mural on ex-Hancock Tower the work of French artist". The Boston Globe. Retrieved 2015-09-25. ^ Smee, Sebastian (September 25, 2015). "With Hancock piece, the public gets an imposing and intriguing gift". The Boston Globe. Retrieved 2015-09-25. Location and size of mass dampers: telephone conversation[original research?] with Richard Henige, LeMessurier Consultants, Inc. This page was last edited on 3 February 2019, at 21:10 (UTC).